Who said Black Friday had to be so materialistic? 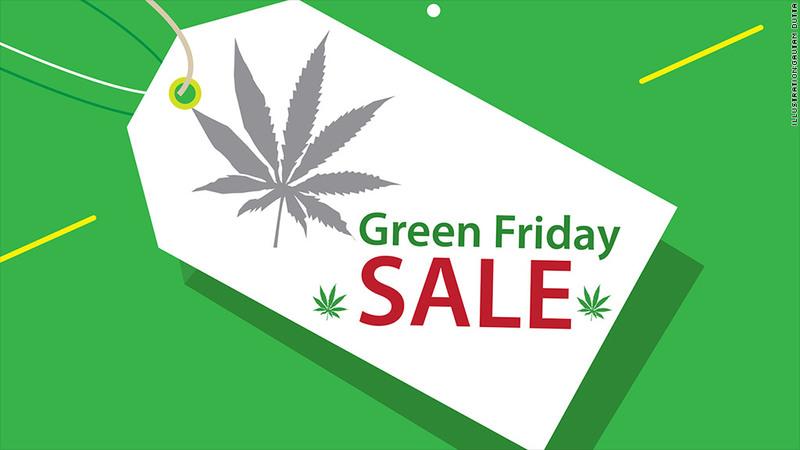 Taking a page from their fellow retailers, Colorado's newly legal marijuana stores are offering killer deals on the day they're dubbing "Green Friday." Denver's The Grass Station is offering limited deals including an ounce of marijuana -- normally $300 -- for as little as $50. Cones -- which are like a big joint and normally cost $10 -- were on sale for a buck. "Now that marijuana is legal here, we've become yet another stop for shoppers looking for holiday deals and thoughtful, unusual gifts," Grass Station founder Ryan Fox said in a statement. "We are insane right now," said Cierra Carter, a clerk at The Grass Station. "We've had a line out the door since early this morning." Nearby at the Medicine Man, Green Friday specials included an ounce for $139 and a quarter ounce for $39 -- a 50% savings. Evergreen Apothecary was offering 15% off to customers who mentioned Green Friday. "It's been so freaking busy down here," said Kala Williams, whose family owns the Medicine Man. "We had a line all the way down the street." It's probably safe to assume that line was pretty peaceful.